Paul made a heartbreaking decision…and chose wrongly. Now he’s back. But can Lynn unbury herself from the emotional rockslide and learn to trust him again? The last thing he wanted to do was walk away. Paul was forced to make a heartbreaking decision to end things with Lynn. It took nearly two years to painfully hammer home that, despite his beliefs, he chose wrongly and all his friends had been right. Including Lynn. Now he’s back and ready to fight for the love he gave up—if Lynn will only give him a chance. The last thing she can do is move on. Lynn never blamed Paul because she understood why he had to leave. She also knows it tore him up inside. Two years later, she’s a shell of her former self and knows logic doesn’t matter when a shattered heart has deeply buried her under a rockslide of pain. The last thing they thought they’d have was a second chance. Paul’s sudden return threatens to upend Lynn’s life. Can she ever trust him again, or will her dreams be cruelly crushed once more? 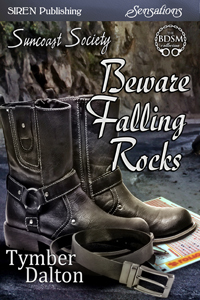 Beware Falling Rocks by Tymber Dalton from Sunshine Reads on Vimeo.